Teletalk 50 Tk Bundle Offer 2018! 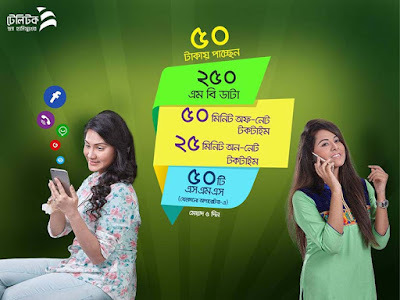 Teletalk 50 Tk Combo Bundle, Now Teletalk customers will be able to enjoy 250 MB, 25 Minutes (Teletalk-Teletalk), 50 Minutes (Teletalk-Teletalk/Others) and 50 SMS at only 50 Tk.Check below for more information about Teletalk 50 Tk Bundle Offer. Teletalk brings some amazing Bundle Offers for their customers, Teletalk Bundle offers are the most favorite to the users. You can now enjoy the best Bundle Offer with Teletalk. Just dial *111*102 # to enjoy Teletalk 50 Tk Bundle Offer. The tariff of the original package will be applicable after the expiry of the COBU pack.